The Lech Latin Licus, Licca is a river in Austria and Germany. It is a right tributary of the Danube 264 kilometres 164 mi in length with a drainage basin of 6,600 square kilometres 2,550 sq mi. Its source is located in the Austrian state of Vorarlberg, where the river rises from lake Formarinsee in the Alps at an altitude of 1,870 metres 6,120 ft. It flows in a north-north-easterly direction and crosses the German border, forming the Lechfall, a 12-metre-high 39 ft waterfall afterwards the river enters a narrow gorge the Lechschlucht. Leaving the Alps, it enters the plains of the Allgäu at Füssen at an elevation of 790 metres 2,580 ft in the German state of Bavaria, where it formerly was the location of the boundary with Swabia. 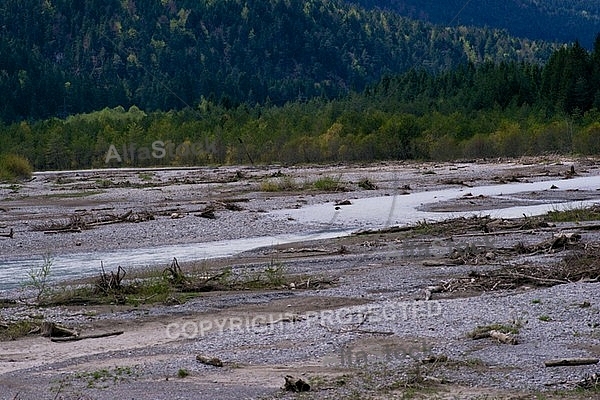 The river runs through the city of Füssen and through the Forggensee, a man-made lake which is drained in winter. Here, it forms rapids and a waterfall.rnThe river flows further northwards through a region called the Lechrain, and passes the cities of Schongau, Landsberg, Augsburg where it receives the Wertach and Rain before entering the Danube River just below Donauwörth at an elevation of 410 metres 1,330 ft. It is not navigable, owing to its torrential character and the gravel beds which choke its channel. There is a particularly magnificent view of the Lech valley from Neuschwanstein Castle, near Füssen.